Image example Morgan Tsvangirai na former prime minister of Zimbabwe. 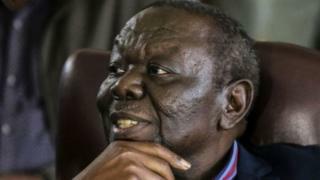 Zimbabwe opposition leader Morgan Tsvangirai dey critically sick for South Africa hospital according to reports wey dey ground. Tori people dey quote some family members say di 65-year-old former prime minister wey dem dey treat for colon cancer dey suffer from lack of energy, weight loss and muscle thinning. During im political struggle against former President Robert Mugabe, im chop beating well well and go prison plenty times. Tsvangirai be di head of Zimbabwe Movement for Democratic Change (MDC) party. Wetin we know about Tsvangirai condition? Im don dey visit hospital since last year June, dey receive treatment for one Johannesburg hospital for cancer. Im return to hospital last month. Tsvangirai health worse on Monday, im family tell Zimbabwe's Bulawayo24 news website on Tuesday. Im dey find am hard to eat or swallow fluids, na so di source talk. Dem dey report say Tsvangirai get breathing problems. Zimbabwe: How Mnangagwa take different from Mugabe?